I’m returning to this blog after a long pause. Too much going on in the other areas of my life to weave with any regularity, sadly. I found a little space before and after the Christmas period. During this time I helped my son David make his first rug, a rag rug in the pattern of Susan Johnson’s wonderful hybrid and very beautiful rugs. He did really well and completed the rug in time to make it a Christmas present for his youngest sister. 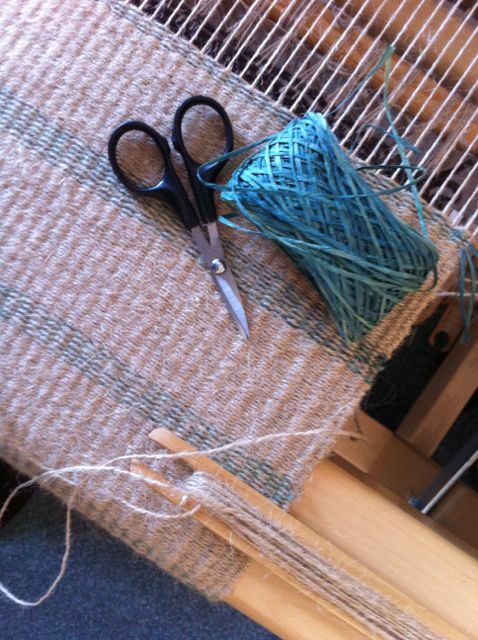 I love the grey wool plain-weave background, quite a feature of Susan’s rugs. There’s a real mix of rags, silk threads, some vibrant wool shades of blue and brick-orange, all kinds of things we found in my stash of yarns. The warp was tussah silk. David had never woven before and under my not-always-watchful-eye did the whole business from winding and chaining the warp, to threading the loom. He made everything look so easy. Oh, that I started to weave at his age! I remember vividly how I struggled at the start (could NOT chain a warp) even with a great teacher – Laura Rosenzweig. Notice the convenient place to keep (pro tem) my warping board. Although I have a proper Toika warping frame I’m rather attached to this home-made one. David’s off to study Fine Art at Manchester Metropolitan University in September. I quietly hope he’ll be tempted to weave some more . . .
With Christmas over I was determined to have a little time on the loom to myself and decided I wanted to make a rug with Jute and raffia. So I made a miniature sample to go on my wall. Its 40 x 80 cm and I’m quite proud of it. Well, it’s still on my studio wall. You’ll see I have this very brown, very thick wool yarn header (bottom right of the photo). It’s from a huge cone of rug wool I was given and it’s perfect for such things. Teaching David (only my second student – I taught his sister Megan-Ruth to make a scarf) made me so aware of aspects of what passes for my weaving practice that wasn’t secure, that wasn’t right. Handling a header was one such problem area. Like so many novice weavers I had the problem of draw-in. I realised that this problem begins with the header. 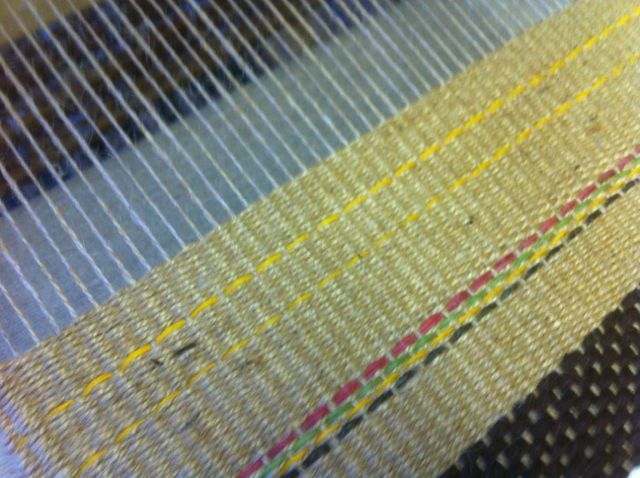 Don’t beat the ends of the header weft hard against the selvedge (what selvedge? With rugs I don’t tend to use one). Now I’ve stopped doing this draw-in, the problems seem to be over. Changing yarn mid-weave was another inconsistency I had, for David’s sake, to give proper guidance on this, and, since I did, my own weaving has improved immeasurably. So the little jute rug was a good experience. The inlay decoration was a spur of the moment thing, but I’ve come to like it. Since I started experimenting with paper and raffia I’ve been collecting different coloured raffia from garden centre stores and craft shops. 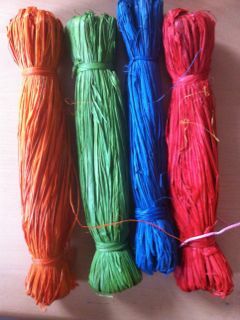 I had the loveliest gift of several raffia hanks for my birthday. So, I’ve been using this natural yarn for inlays, although no raffia can quite emulate the beautiful Habu paper yarn I was given some time ago now, and until recently has been a kind of ornament sitting on my bookcase next to my weaving tools. This exquisite yarn finally made it onto my next jute rug, a much bigger affair altogether. 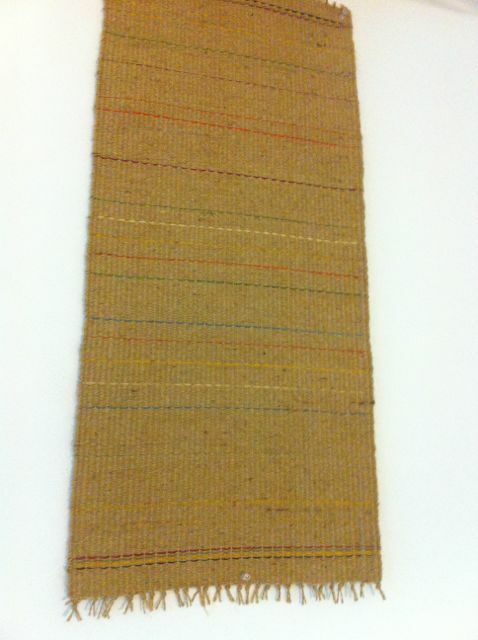 You can see how subtle this paper inlay looks against the jute. It was such a pleasure to weave. Working with jute on a larger scale 120 x 60 was not without difficulties, but I did finish the piece and it’s found a home in friend’s bedroom. It’s a nice texture against the bare foot . . . The inlay pattern above gradually grows in width and then gradually diminishes, although this process has irregularities and crooked symmetry. If you were to look carefully at the whole rug, in fact any rug of mine, you’ll see I’ve picked up Susan Johnson’s free-form patterning. No symmetry for me. There’s a certain amount of unplanning. I remember observing that with some projects my former teacher Laura Rosenzweig would dip her hand into a bag of yarn and pull out something her eye had not previously seen or chosen. . . . and she’d use it as part of a patterning. Whilst I’ll choose colours I’m wary of being too careful with pre-designing. 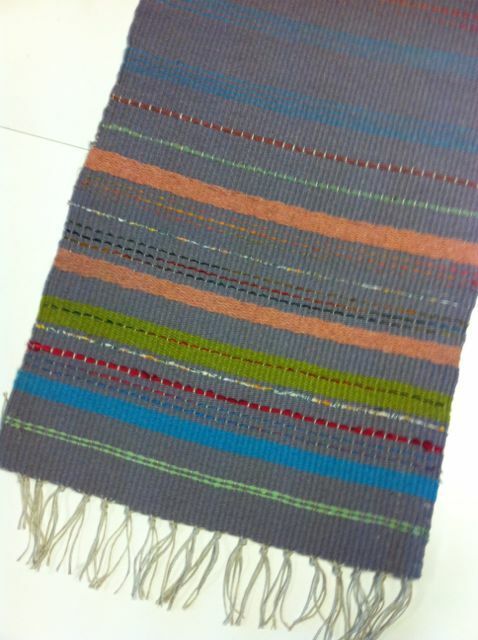 Surprise, intuition and spur of the moment decisions are right for my kind of weaving. After the jute projects my loom has been quiet. It’s in my office / studio so I see it there every day – a reminder, a temptation, a sadness that I haven’t got a project on the go. But life intercedes, and finding the time to put a project together sometimes seems impossible. In the interim I was able to spend most of a fortnight at the Stroud International Textile event, which, although a little short on woven textiles this year was inspirational in many other ways. 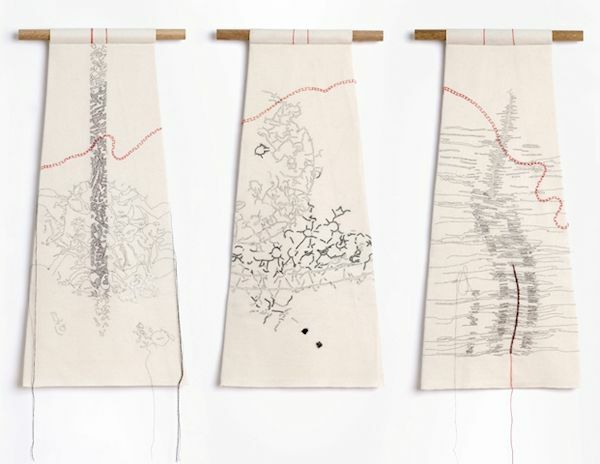 Alice Fox’s tiny woven Tide Line pieces were a highlight of her first solo show at SIT. This little tapestries attached to rusted pieces and bathed in sea water (on a Scottish beach) were very popular with visitors to her show. 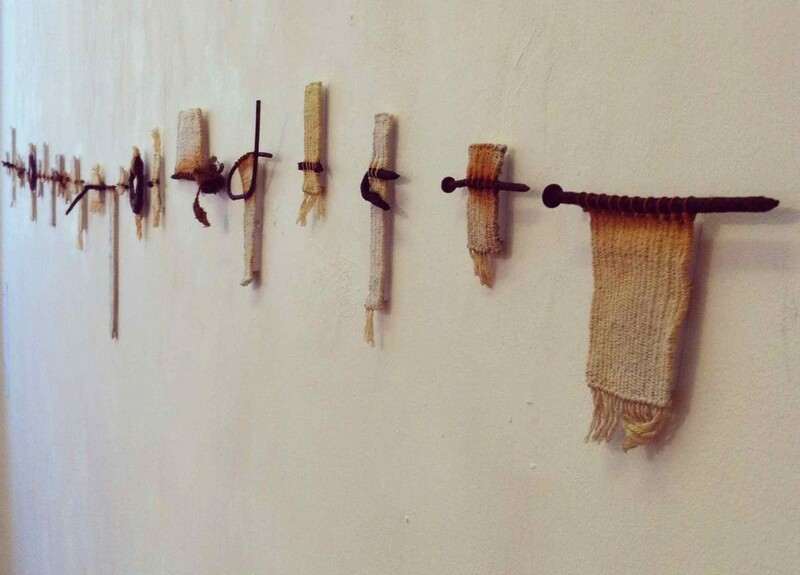 They are woven gems and curiosities, and together occupied a whole wall of the gallery. You can see them next week (for a month) at the Art Link Gallery in Hull where her Tide Marks show opens on 26 July. Another highpoint of Stroud was discovering Caroline Bartlett. Her nine piece collection of embroidered ‘maps’ stole my heart. I was fascinated by these pieces, although I found her ‘interpretation’ a little mysterious, over-coded, impenetrable (?). Still, it didn’t matter, the way she laid silk yarn on top of the surface so the images seem to float was wondrous. Before leaving Stroud I spent a Sunday morning at Newark Park. This was the location of a SIT installation curated by the deft and imaginative SIT director Lizzie Walton. I loved the house and the way new work in ceramics, textiles, drawing, painting, embroidery had been cunningly incorporated into the varied rooms of this magical former hunting lodge. I was inspired by this place, inspired to write this poem. But back to weaving and my current project – at last. I’ve had this linen yarn in Fog and Khaki (Texere’s best – from their amazing range of colours) sitting on my craft table for a long time, looking tempting, decorative almost. 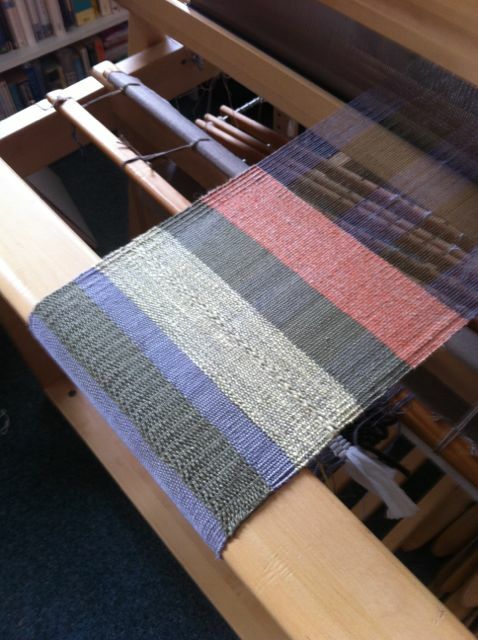 I decided to create a table runner using these yarns as a starting point – a mixed warp. I got out my Reed number 10 and for once didn’t thread with a gap between dents (as one does for rugs). Putting on a warp in linen I find tricky because the ends fray and (for me) knots are difficult. But it’s done (the warp that it – despite the occasional slippage of threads on the back beam – not used to this) and I’m almost halfway through this project. I’m playing I know, an experiment, but an enjoyable one and I have rather liked mixing fine linen / cotton yarns together and even incorporating in a little twill pattern (from Anne Dixon’s A Handweaver’s Pattern Book, a book that I imagine every self-respecting weaver has by now). I know, it’s all a bit ad hoc, but it will brighten up someone’s table – if I can persuade a friend to live with it! I’m more comfortable with the idea of rugs, but it’s good to ring the changes. This entry was posted on July 22, 2014 at 7:50 am and is filed under Uncategorized. You can follow any responses to this entry through the RSS 2.0 feed. You can leave a response, or trackback from your own site. 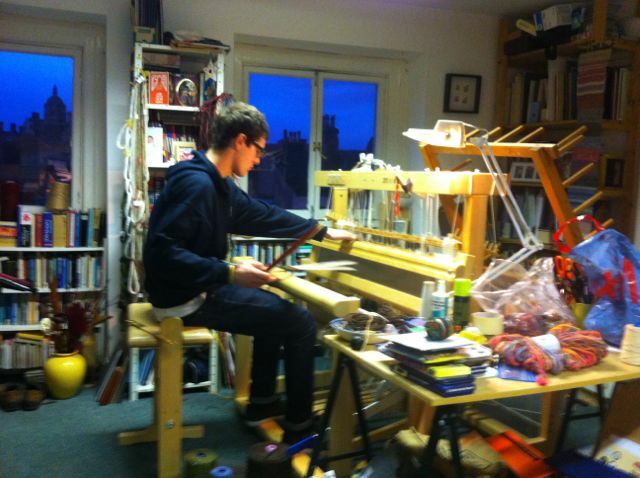 Good to see you are back at the loom again and blogging about it! I think you mean Anne Dixon’s book…. So nice to get the children involved.